Vast, breathtaking, and wondrous. It’s no wonder why five million people visit the Grand Canyon every year. Millions dream of a trip to see this world wonder but many don’t know what to do in the Grand Canyon once they arrive. Luckily, there are many great things to do in the Grand Canyon South Rim. 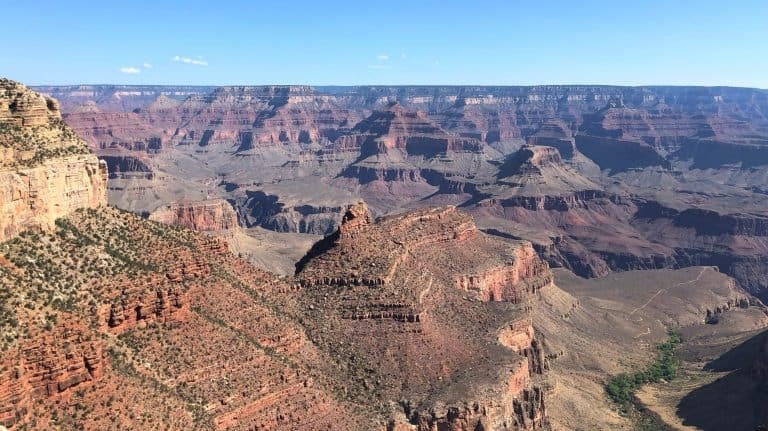 Here is your guide to visiting the South Rim of the Grand Canyon with kids, including dining suggestions, lodging information, and plenty of tips for an awesome trip. The Grand Canyon South Rim is open for business 365 days a year. It is by far the most visited rim of the Grand Canyon. The South Rim is closest to major cities such as Phoenix and Las Vegas and has the most lodging and services. The South Rim is great to visit any time of the year, but each season comes with its pros and cons. Winter is beautiful and the crowds are far fewer, but snow and ice can lead to temporary road closures. Highs are typically in the 40s. Spring tends to be less crowded as well, minus the flux of visitors during Spring Break. Weather is typically in the 50s and 60s, warming towards the 70s and 80s in May and June. Summer is peak season. The crowds are omnipresent and the weather is at its warmest; highs are usually in the 80s. Afternoon thunderstorms are common. Fall is less visited than spring, temperatures are far cooler than the summer, and precipitation is less common. 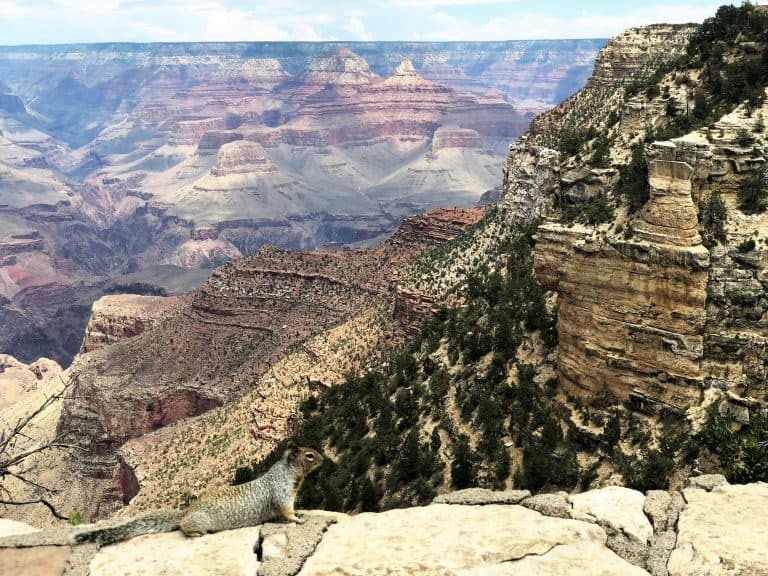 Jump start your trip planning with this 3-Day Itinerary for visiting Grand Canyon National Park. One of the most common ways for families to get to the Grand Canyon is to take a road trip. The Grand Canyon is 3 1/2 hours from Phoenix and 4 hours from Las Vegas. Many families fly into these major airports, rent vehicles, and drive to the park. 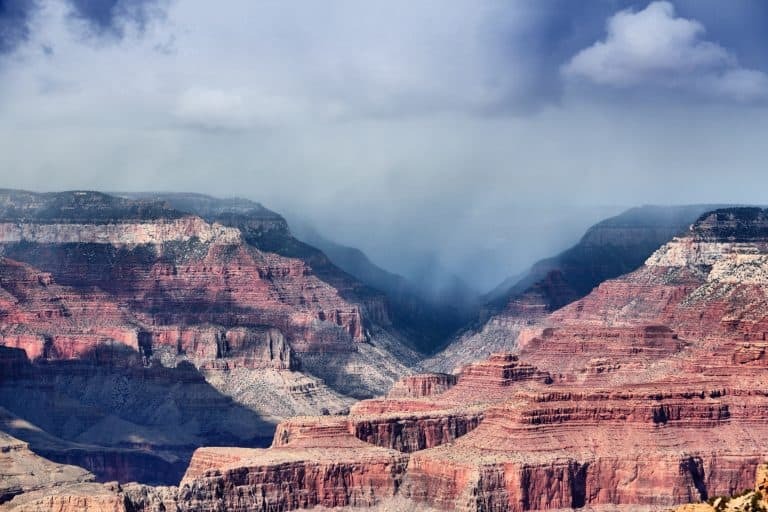 Others add a visit to the Grand Canyon with kids to a longer road trip itinerary. Admission to the Grand Canyon National Park is $35 per vehicle. One of the more fun and unique ways to arrive at the Grand Canyon with kids is via train. 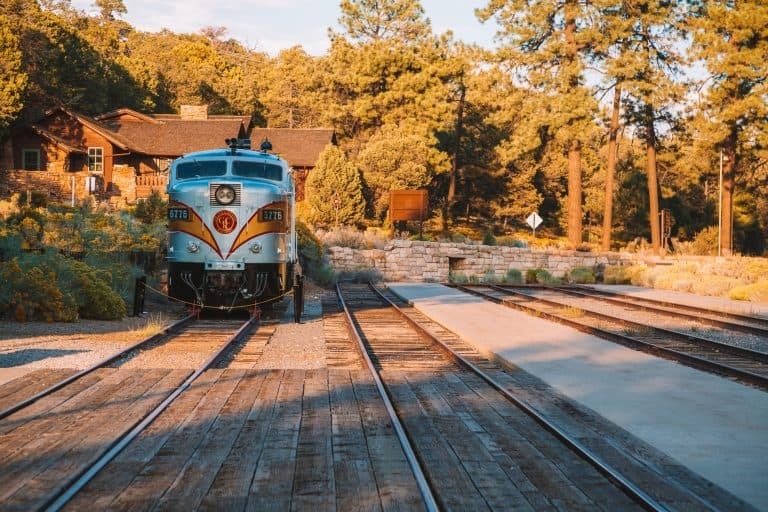 The Grand Canyon Railway departs from Williams, Arizona and drops guests near the El Tovar Hotel, just steps from the Grand Canyon rim. The railway offers 6 classes of service, from a basic Pullman car reminiscent of the 1920s to the luxury parlor with its private bar and afternoon snacks. Live entertainment and gorgeous views keep guests entertained on the 2 hour journey to and from the Grand Canyon. There is even a fun “train robbery” on the trip back to Williams. 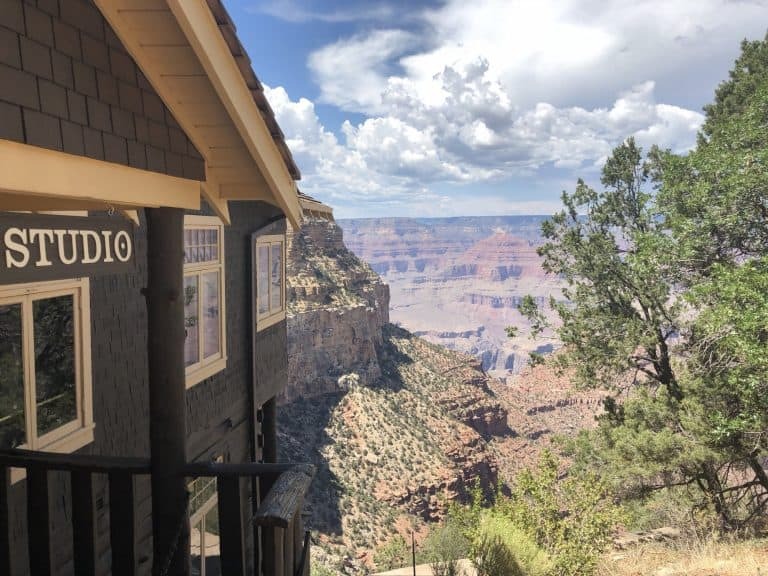 Special booking packages allow guests to stay at Grand Canyon lodging overnight so they have more time to explore the area. Over a half million people see the Grand Canyon via helicopter or small plane each year. It is a great way to take in the vastness of the canyon. It is also a good way to see the Grand Canyon if you are pressed for time and staying in the Las Vegas area. Helicopter tours depart from Las Vegas, Nevada, as well as from small airports near the West and South Rims. There isn’t typically a minimum age for helicopter flights, but we always suggest consulting with any potential tour providers before booking. Tours coming from Las Vegas are typically about 4 hours in length and often include views of the Hoover Dam, Lake Mead, and the western end of the Grand Canyon. 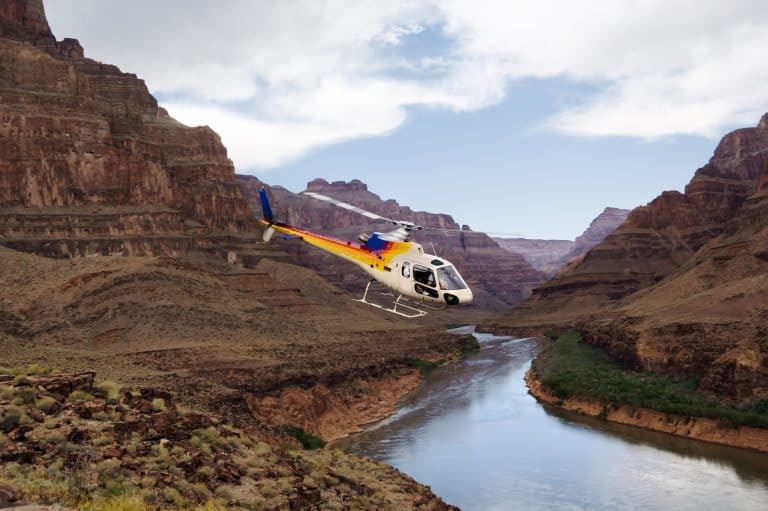 Some tours even land at the bottom of the Grand Canyon near the Colorado River! The price is around $300 per person. Expect 70 minutes of actual time in the air. Flights from the small, South Rim and West Rim airports are less expensive They range in price from $200 -$400 depending on duration. There is also a small plane option that is more economical for about $145. Since free shuttles run to major points of interest on the South Rim, we suggest parking where you can and then utilizing the shuttle to get around. There are parking lots at the Visitor Center, Market Plaza, Grand Canyon Village, and Desert View. Lots in popular spots such as Grand Canyon Village can fill up as early as 9am. Shuttle buses arrive at stops every 10-15 minutes during daylight hours and every 30 minutes during the hour before sunrise and hour after sunset. We always recommend heading to a park visitor center and picking up a Junior Ranger booklet when arriving in a National Park. There are separate Junior Ranger programs for the North and South Rim of the Grand Canyon and they each have their own badge. On the South Rim, you can pick up booklets at the Grand Canyon Visitor Center, Verkamp’s Visitor Center Park Headquarters, or Tusayan Museum near Desert View. If you hike or ride a mule to Phantom Ranch, definitely get the Phantom Ranch Junior Ranger Booklet from the canteen, campground, or Ranger Station. Once completed, kids will get a special badge, certificate, and patch. Check for deals on family-friendly hotels in South Rim, Arizona. 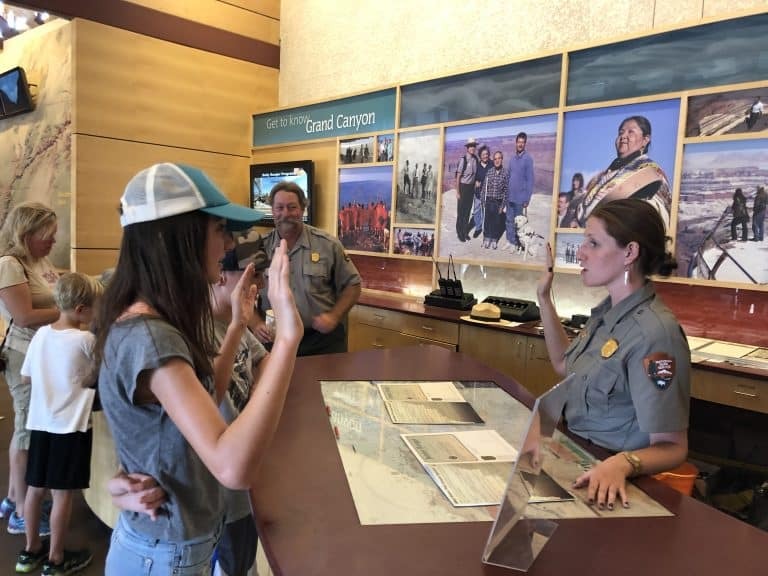 The Grand Canyon Visitor Center is the ideal place to pick up Junior Ranger booklets, join ranger-led programs, and speak with Park Rangers about potential hikes and points of interest. There are exhibits inside the Visitor Center as well. The Grand Canyon Visitor Center is located at Mather Point, a popular place to watch sunrise and sunset. There are restrooms and water stations at this location. This is a great place to rent bikes and enjoy the canyon on two wheels. Stroller and wheelchair rentals are also available. A cafe at the Visitor Center is a good spot to grab quick items such as breakfast burritos and pre-packaged sandwiches. Don’t miss the Yavapai Geology Museum near the Visitor Center. It is a neat place to learn about the canyon’s fascinating geological history. This area is home to the General Store, a great place to load up on food and supplies while staying in the Grand Canyon. They also have a coffee shop with some breakfast items as well as a deli. Need cash? There is a Chase ATM at this location. Want to send a postcard? There is a Post Office next to the market. Camper services such as showers, laundry, and a dump station can be found in this area. Yavapai Lodge is located in this area and has breakfast, lunch, and dinner options as well. If you need to check in at work, this is also a great place to take advantage of free Wi-Fi. 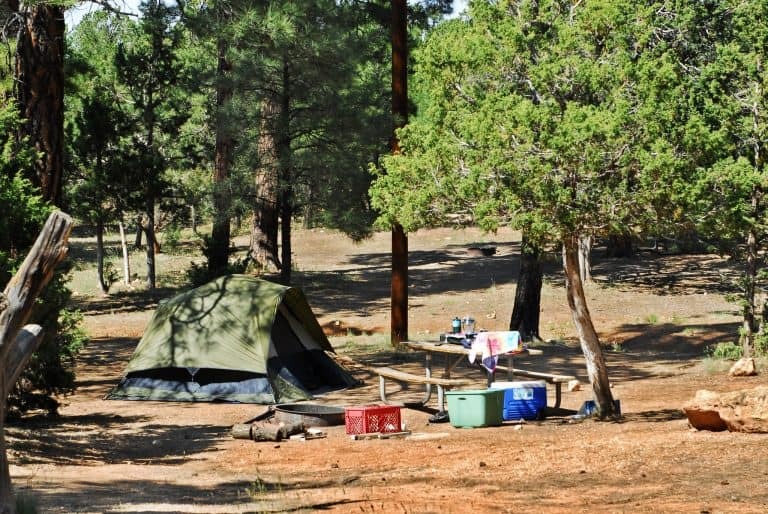 Mather Campground, the largest campground at Grand Canyon National Park, is located in this same area. Grand Canyon Village is the hub of activity on the South Rim of the Grand Canyon. Arrive by 9am during the summer and busy holidays if you want to find a parking spot. This is also where the train depot is located. Grand Canyon Village is home to El Tovar Hotel, Kachina Lodge, Thunderbird Lodge, and Bright Angel Lodge. The rim trail along this part of the Canyon is a very popular place to walk and take in canyon views. There are several buildings to stop and visit along the rim in the Village. The Verkamp’s Visitor Center is a good place to look at exhibits, speak with Rangers, get passport stamps, and refill water bottles. Hopi House is a National Historic Landmark filled with Native American art and crafts for sale. Lookout Studio and Kolb Studio are located right on the edge of the rim and are great places to take in views. This is the premier dining experience at the South Rim of the Grand Canyon. Advanced reservations are highly recommended, especially for dinner. Dinner is a fine dining experience and shorts and flip flops are discouraged. If you are visiting the Grand Canyon with kids, I suggest opting for lunch at El Tovar when things are more casual. Sandwiches, salads, as well as specialties like Blackened Salmon and Beef Stroganoff, are served at lunch. I recommend trying the Navajo Taco. A kids menu is available. Craft cocktails and Arizona microbrews are popular drink options. This is the more upscale option of the two restaurants at Bright Angel Lodge. Reservations are recommended for dinner. Unlike the El Tovar Dining Room, the dress code is casual, so dinner here is still an okay option for families with young kids. Tacos, chili, tamales, and a bison burger are lunch menu highlights. Dinner-sized salads, grilled fish, ribs, steak, and pork chops are popular dinner options. Don’t miss their signature margarita. Harvey House Cafe is the South Rim’s popular, casual dining option. If you are staying in the Grand Canyon with kids, it may be your best bet for sit-down meals. They serve three meals per day. Lunch options include soups, salads, sandwiches, and burgers. There are several dinner menu items that appeared on the menu during the mid-20th Century such as roasted turkey, trout filet, and Santa Fe spaghetti. Burgers and fajitas are other popular dinner menu options. There is a kids menu. Note: We found service to be a bit slow during our lunch and dinner at this spot. Bring your patience and something to entertain the kids. Reservations are not available. There is nothing better than an ice cream cone after a long day of hiking in the heat! The Bright Angel Fountain is the place to go for ice cream and shakes as well as quick sandwiches. 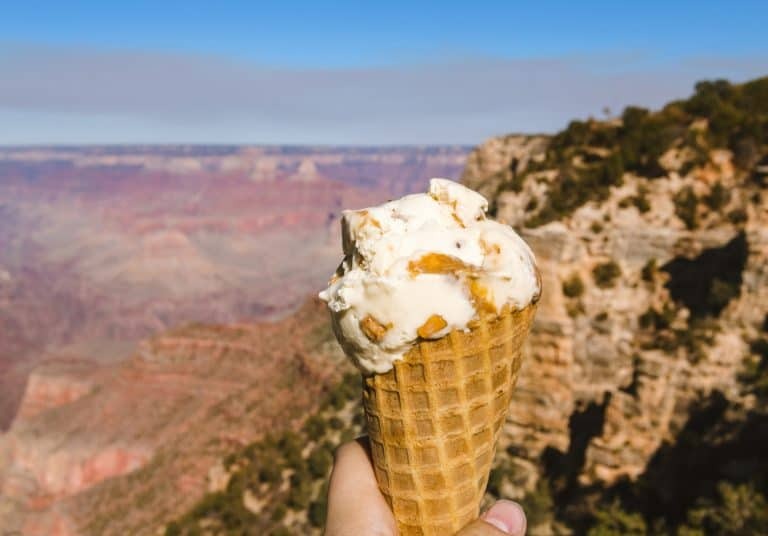 A scoop of mint chip with sprawling Grand Canyon views- it doesn’t get better than that! Not technically in Grand Canyon Village but close- Maswick Lodge is either a short walk or one shuttle stop away. There is a food court with hot sandwiches, deli sandwiches, hamburgers, and various entrees. There is also a Pizza Pub that serves pizza, salad, and beer. Both are good options for those visiting the Grand Canyon with kids. Head east of the Grand Canyon Visitor Center to reach Desert View. This a great spot to enjoy views of the Grand Canyon that include the Colorado River at the bottom. 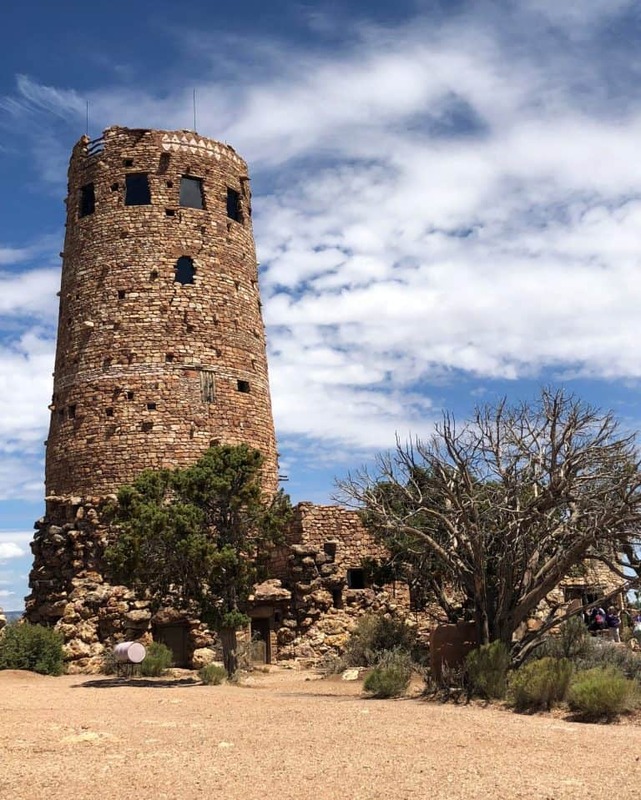 Besides enjoying the views, visitors should also take time to explore the Desert View Watchtower. Climb to the top and enjoy 360 degree views. Desert View also has plenty of bathrooms, a trading post which sells coffee and ice cream (a key ingredient to any successful day in the Grand Canyon with kids), and a market/deli which sells supplies, breakfast sandwiches, sandwiches, and hot dogs. Take the free shuttle west of Grand Canyon Village and stop at various points and vistas on your way to Hermits Rest. Don’t miss Pima Point which is known for its sunrise and sunset views, as well as the sound of the Colorado River roaring below. Hopi Point is another great place to stop along the way. Walk the Rim Trail for as long as you would like, and then hop on the shuttle to take it the rest of the way. At Hermits Rest there are restrooms and a snack bar that sells various snacks, sandwiches, and ice cream. It is 8 miles from Grand Canyon Village to Hermits Rest. Hiking in the Grand Canyon with kids is unlike many other western National Parks. There are basically two main hikes that people take on the Grand Canyon South Rim. The first is the Rim Trail, which runs a total of 13 miles in length along the canyon’s edge. It is mostly flat and many sections are suitable for strollers and wheelchairs. This is the best hike to do with young children. Walk away from the crowds near the Village, Visitor Center, and shuttle stops to enjoy peaceful canyon views. The great thing about the Rim Trail is that with the numerous shuttle stops you can make your hike as long or as short as you like! The other major trail that people attempt is the Bright Angel Trail. This trail is 10 miles long and descends 4,380 feet into the Grand Canyon until it reaches the Colorado River. It is very steep and exposed, not making it ideal for families. Temperatures can vary wildly. It may be in the 80s up at the top of the trail and well over 100 at the canyon bottom. We suggest families hike a portion of the trail to get an idea of what it is like to be surrounded by the canyon walls. The trail begins west of Bright Angel Lodge. There is a resthouse at 1 1/2 mile mark which has toilets and water. The elevation change is 1,131 feet. This is a good place to turn around. Remember, it will take much longer to climb up then it did to go down! If you opt to head down to the 3-mile resthouse, keep in mind that you will have to face a 2,000 foot elevation change on the way back up and that your hike will total 6 steep miles. Check out our picks for the Best National Park Hikes. 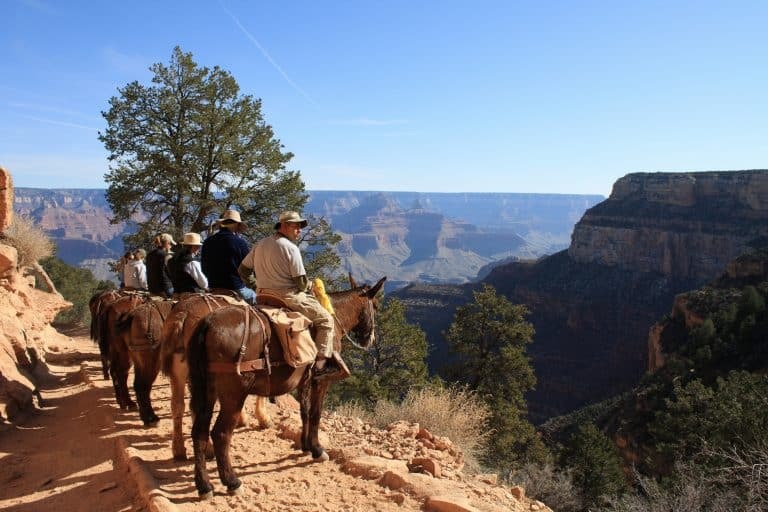 One of the more iconic things to do in the Grand Canyon is to take a mule tour. In order to take a mule trip in the Grand Canyon riders must be at least 57 inches tall and 9 years old. South Rim mule trips can be booked 15 months in advance and they fill up early! The Canyon Vista Rim Ride is a 3-hour trip which follows the rim of the Grand Canyon. There are many stops along the trail (6+) where mule riders learn about geologic formations, history, and more. The mule trip down into the canyon is a 5 1/2 hour journey, with break stops and lunch along the way. A night (or two) is spent at the Phantom Ranch and dinner is included. This journey is best for older children who don’t have a fear of heights or large animals. Spending more time in Arizona? Check out the Top 10 Things to do in Arizona with Kids. There are many lodging options at the South Rim of the Grand Canyon. They all fill up early so advanced reservations are highly recommended. We highly recommend staying in Grand Canyon National Park to take advantage of the peace and quiet that occurs after in the morning hours of the park. Stepping outside of your hotel room at 8am and not having to battle crowds to enjoy the views or a stroll along the rim trail is wonderful. A good chunk of the Grand Canyon South rim lodging can be found in Grand Canyon Village. 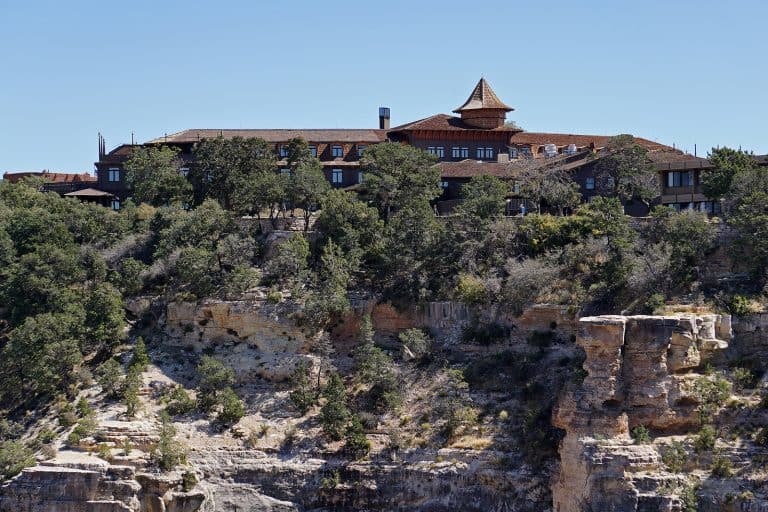 This is the most famous Grand Canyon hotel. It is the most upscale, built by the railroads and known for hosting a variety of famous figures such as Bill Clinton, Oprah Winfrey, and Paul McCartney. It is no surprise that this is also the most expensive lodging option in the park. There are standard, deluxe, and suite-style rooms. This National Historic Landmark was designed by famed architect Mary E. J. Colter and her signature style is reflected in the architecture. Many of the rooms only have one bed and shared bathrooms, not making them ideal for families. There are also some cabins within the Bright Angel Lodge complex and many do have rim views. Located next to the El Tovar Hotel, the Kachina Lodge is a good option for families who are looking for a great location. The lodge is located on the rim of the canyon, so amazing views are waiting just a few steps outside your door. Rooms are akin to nice motel rooms, and many rooms have two queen beds. There is no dining service available at the lodge but several dining options are just a short walk away. The Thunderbird Lodge is basically the twin of Kachina Lodge. The design and amenities (tv, coffee maker, mini fridge) are basically the same. They are located right next to each other, so views and nearby food options are the same as well. Maswik Lodge is located 1/4 miles from the rim at Grand Canyon Village. It is an easy walk or free shuttle bus ride to the hustle and bustle of the Village. Rooms are motel style with basic amenities such as coffee makers, TVs, and mini fridges. Rooms have either one king or two queens. There is a food court, gift shop, and a pizza pub at this location. Note: The Maswik South building will be closed beginning April 2019 for upgrades. If you are visiting the Grand Canyon with kids, Yavapai Lodge is one of the best lodging options. It is located near Market Plaza. The only lodging in Yavapai that has air conditioning is Yavapai East. The rest of the rooms do not. In addition to regular king and two queen rooms, the lodge also has family rooms which have a king bed and twin bunk beds. Have a large family? Double Queen Family rooms feature 2 queen size beds and a twin bunk bed and can accommodate up to 6 guests. All the rooms at Yavapai West have two queen beds and are pet-friendly. There are mini fridges, TVs, and coffee makers in the rooms at Yavapai. This is the only campground that is close to the main hub of action on the South Rim and it is a great option when visiting the Grand Canyon with kids. Reservations are highly recommended outside of the winter season and be booked 6 months in advance. Mather Campground is located close to Market Plaza and along the free shuttle route. Tent and RV sites are available but there are no hookups. There are over 300 sites at the Mather Campground. Pay showers and laundry are available. Mather is the only campground on the rim that is open in the winter, but there are no reservations available during that time and the campground office is closed. If you are looking for an RV village with full hook-ups, Trailer Village is the spot for you. It is located next to Mather Campground. Open mid-April through mid-October, Desert View is a good option if Mather is full. 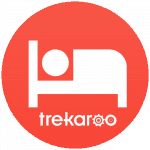 There are 50 sites that accommodate tents or small RVs. Reservations are not allowed at Desert View Campground. There are no hookups or shower facilities at Desert View so head into the Market Plaza area to utilize the pay showers. Check out is 11am and the campground is typically full by noon. Plan accordingly. The desert air is harsh and drying. Pack plenty of sunscreen and lotion. Afternoon thunderstorms are common in the busy summer season. Be sure to pack a rain jacket in your daypack. If you see lightning in the area, head towards shelter immediately. There are several water filling locations in Grand Canyon National Park. Bring your reusable water bottles and drink plenty of water. Arrive at Grand Canyon National Park as early in the day as possible to avoid long lines at the Entrance Station. I can’t say this enough- park your car where you can and take advantage of the free shuttle system. It runs often and is incredibly convenient. Wake up early and enjoy the quiet before the crowds show up. 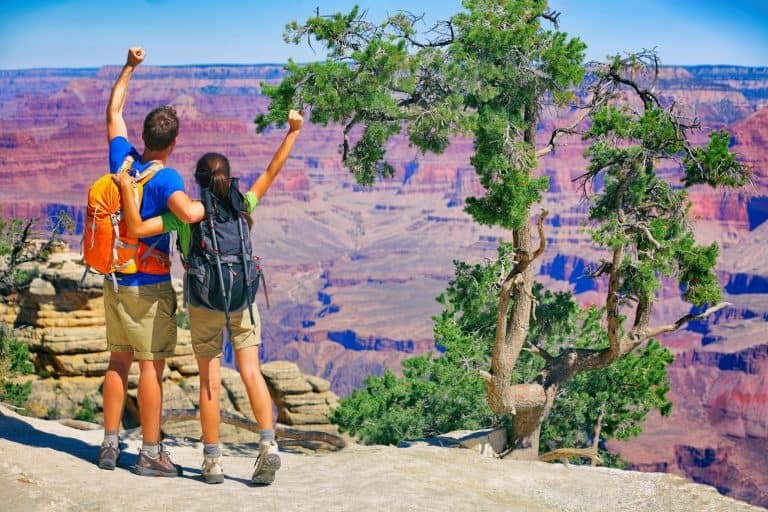 Most people visiting the Grand Canyon are day trippers. The morning and twilight hours are the best time to spot wildlife like elk. Bonus- the early morning light is beautiful on the canyon. Don’t hike down into the canyon unless you are physically fit and prepared to make the trek back up. Keep in mind that temperatures are considerably warmer inside the canyon.